In order to deal effectively with such emerging factors as multi-jurisdictional intellectual property rights and contractual issues surrounding employment or immovable property, a system of international bankruptcy and insolvency law is sorely needed. 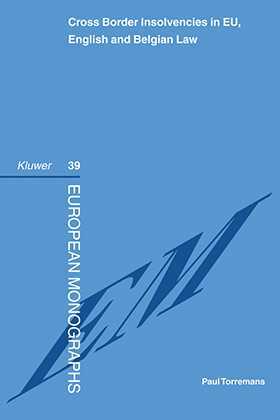 This important monograph shows how such a system is ready to hand in Europe and potentially available at a global level. As an obvious step in this direction, Professor Torremans examines the EU Regulation on Insolvency Proceedings. He analyses all its provisions in detail, and sets out the solution it puts in place, partial and imperfect as it may be. He concludes that within the EU this Regulation promises to improve matters substantially, and that it bodes well to become a model for international co-operation in this area. To demonstrate the need for a coherent cross-border insolvency law regime, Professor Torremans first describes two very different national approaches, those of Belgium and the United Kingdom. He explores these two traditional approaches in detail, stressing their practical applications, and finds neither system can offer a satisfactory solution in a cross-border context. Finally, recognising that this problem does not stop at the EU's borders, Professor Torremans examines the UNCITRAL Model Law in detail to see whether it does indeed make a useful contribution. This is a valuable and highly practical analysis that can immediately be put to good use by practitioners and officials charged with the organisation of bankruptcy and insolvency proceedings anywhere in the world.